caption Optical tranversal section, showing the nucleus. The thin, barely visible floating extensions are made of chitin. Furthermore, filamentous bacteria colonies are attached. Scale bar indicates 50 µm. 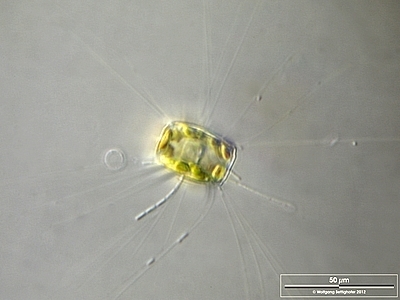 Sample from the Lake Constance (vicinity of Bodman). The image was built up using several photomicrographic frames with manual stacking technique. Images were taken using Zeiss Universal with Olympus C7070 CCD camera.